At an Alabama political rally on Sept. 22, President Donald Trump said, “Wouldn’t you love to see one of these NFL owners, when somebody disrespects our flag, to say, ‘Get that son of a (expletive) off the field right now. Out. He’s fired. He’s fired! '” But can government leaders or employers force individuals to participate, in the customary way, in national rituals? The legal issues raised by President Trump in his remarks are essentially twofold. The first deals with whether a business owner can mandate certain conduct in a private workplace. The second speaks to whether government can force conventional conduct, such as putting one’s hand over the heart while reciting the Pledge of Allegiance. That situation has a simple legal answer; the first does not. 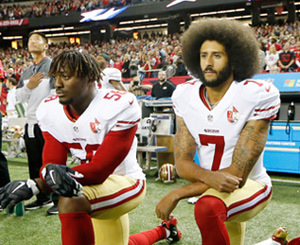 When former San Francisco quarterback Colin Kaepernick first knelt last year rather than stand during the national anthem to protest police violence against blacks in the U.S., his conduct set off similar actions by other pro athletes and a national debate. The conversation continued into this year, focusing primarily on whether the decision by NFL teams not to sign the free agent Kaepernick was in retribution for his protest and, if so, was that fair? The president’s decision to weigh in and the way he did it, in the lingo of sports, raises the conversation to a whole new ball game. Trump’s comments highlight both constitutional and contractual issues. In 1943, the U.S. Supreme Court prohibited public officials, whether the president or a member of a school board, from punishing an individual for refusing to recite the Pledge of Allegiance. The high court, in a 6-3 decision, upheld a challenge from a Jehovah’s Witness family from West Virginia to expel their daughters, who had been punished for refusing to salute the flag and repeat the Pledge of Allegiance, something state law required of students regardless of their religious teachings. What was remarkable in this case was that only three years earlier the court upheld a similar expulsion in Pennsylvania. In the West Virginia case, Justice Robert Jackson, new to the bench in 1941, wrote: “Struggles to coerce uniformity of sentiment in support of some end thought essential to their time and country have been waged by many good, as well as by evil. … Those who begin coercive elimination of dissent soon find themselves exterminating dissenters. Compulsory unification of opinion achieves only the unanimity of the graveyard. It seems trite but necessary to say that the First Amendment to our Constitution was designed to avoid these ends by avoiding these beginnings.” While the case involved the Pledge of Allegiance, legal experts say the national anthem would be treated similarly by the courts under the First Amendment. Many First Amendment protections apply only to the government, however. Private employers including the NFL could have more solid legal grounds to fire a player for a sideline or other protest. As a private entity, a football franchise would have wide latitude in many states to dismiss workers under the “employment at will” doctrine. A player, meanwhile, has strong First Amendment rights to free speech and expression, but that primarily protects him from governments. In this case, both free speech and contractual issues would likely tie up the firing in the arbitration process and the courts for years. Sports Illustrated, which explored this question in the wake of Trump’s Alabama remarks, noted that several provisions of the NFL contract could collide, giving both the NFL owner and the protesting player legal footing. As SI pointed out, two relevant contracts apply: the player’s employment contract with his team and the collective bargaining agreement that governs the player’s working conditions as an employee of one franchise in a league. While interesting fodder for the legal scholar and the pundit, the arguments likely will not be tested. From early indications, no NFL owner appears to be taking up the president’s call of action.